The latest images are in from Saturn’s very own personal paparazzi, NASA’s Cassini spacecraft, fresh from its early morning flyby of the ice-spewing moon Enceladus. And, being its last closeup for the next three years, the little moon didn’t disappoint! The image above is a composite I made from two raw images (this one and this one) assembled to show Enceladus in its crescent-lit entirety with jets in full force. The images were rotated to orient the moon’s southern pole — where the jets originate — toward the bottom. Cassini was between 72,090 miles (116,000 km) and 90,000 miles (140,000 km) from Enceladus when these images were acquired. This morning’s E-19 flyby completed a trio of recent close passes by Cassini of the 318-mile (511-km) -wide moon, bringing the spacecraft as low as 46 miles (74 km) above its frozen surface. The goal of the maneuver was to gather data about Enceladus’ internal mass — particularly in the region around its southern pole, where a reservoir of liquid water is thought to reside — and also to look for “hot spots” on its surface that would give more information about its overall energy distribution. 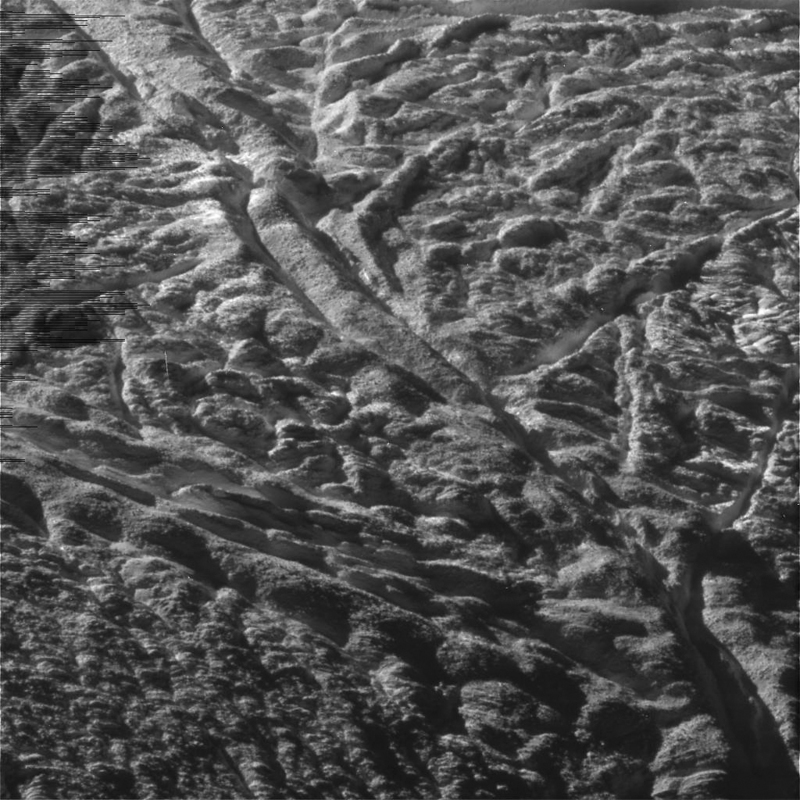 Cassini had previously discovered that Enceladus radiates a surprising amount of heat from its surface, mostly along the “tiger stripe” features — long, deep furrows (sulcae) that gouge its southern hemisphere, they are the source of the water-ice geysers. Cassini also used the flyby opportunity to study Enceladus’ gravitational field. By imaging the moon with backlit lighting from the Sun the highly-reflective ice particles in the jets become visible. More direct lighting reduces the jets’ visibility in images, which must be exposed for the natural light of the scene or risk “blowing out” due to Enceladus’ natural high reflectivity. The images below are raw spacecraft downloads right from the Cassini’s imaging headquarters in Boulder, CO.
Cassini also swung closely by Dione during this morning’s flyby but the images from that encounter aren’t available yet. Stay tuned to Universe Today for more postcards from Saturn! As always, you can follow along with the ongoing Cassini mission on JPL’s dedicated site here, as well as on the Cassini Imaging Central Laboratory for Operations (CICLOPS) site. Views from Cassini are always appreciated – thanks for the update! Traditional thought has it that moon’s like Enceladus were either formed by ‘left over’ accretion materials from Saturn’s formation or they are gravitationally captured objects, planetesimals that formed earlier and much further out, then were captured by Saturn. Lately, interstellar rogue planets have been confirmed – lots of them – so might it be that Enceladus is one of these? Hard to prove – isotopic species analysis anyone? There are many suspect objects! What if we later find that Saturn’s magnetic field actually captures enough anti matter providing the energy required for nucleosynthesis? And then we find this process at the magneto sheath charge boundary or equatorial plane. This is where solar wind particle accretion is ongoing and subsequently provides elemental hydrogen and ionized oxygen for water molecule formation. Eventually we find that many of Saturn’s moons are captured rocky objects covered with ice from Saturn! Ongoing ring formation at Saturn is implied, of course.